(2007-2012) From the very begining, The Scots Kirk in Lausanne has supported this project for five blessed years. Their support funded the children’s daily needs and schooling and was pivotal in setting up the hen farm project. The Scots Kirk keeps providing precious help on various occasions and whenever possible. Click for more. 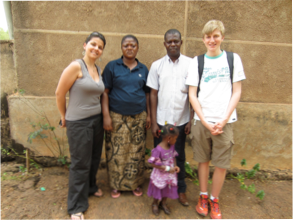 (2012-2014) The Collège Champittet Foundation very generously supported and helped fund the Espoir Jeunes Burkina Faso project. It is with their help that the boys’ dormitories have been built in the Summer of 2013. In the Summer of 2014 the sanitary installations have been completed and by Fall 2015 the contruction of dorms for 15 girls was completed. Click for more. (2016) The Fondation Nicolas Depreux has generously helped us fund an agrarian /educational project, a vegetable garden of 10’800 m2 irrigated by the drip technology. Beside the expected income originating from the sale of the produce, 12 young people will learn the trade both technologically and marketing-wise. (2013) Prix Pralong: this competition was won by one of the youngest members of our association (Ted Baldwin), and its prize was the starting point for the construction of our first water well. 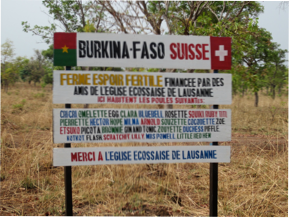 (2016) Swiss Aid Burkina Faso was the main force behind the implementation of this important project.